На данном уроке мы познакомимся с косвенными вопросами – reported questions. В ходе занятия мы вспомним, что такое косвенная речь, а также узнаем, как передавать общие и специальные вопросы в косвенной речи. Reported speech is when you say somebody else about what you or another person said before. Distinction must be made between direct speech and reported speech. She says that she likes tuna fish. She said that she was visiting Paris the following weekend. When you use reported speech, you either report statements, questions, requests, orders or other types. When transforming questions, use the same rules as in reported statements. Check whether you have to transform pronouns, demonstratives, tenses, and time or placeexpressions. She says that her dad likes roast chicken. He says that he writes English poems. When transforming questions into reported questions, use question words (“when”, “where”, “how”, etc.) or “if”/“whether” depending on the type of the question (“yes/no questions” or “special questions”). 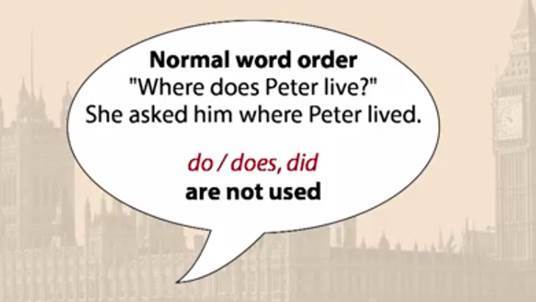 Remember to use the normal word order in reported questions. It means that the subject comes before the verb and there is no need to use auxiliary verbs (see fig. 1). The structure in ‘Yes-No Questions’: ask + if/whether + clause. Listen, read and pay attention to direct/reported questions. And why? I've never known. The structure in ‘Wh-questions’: ask + question word + clause. 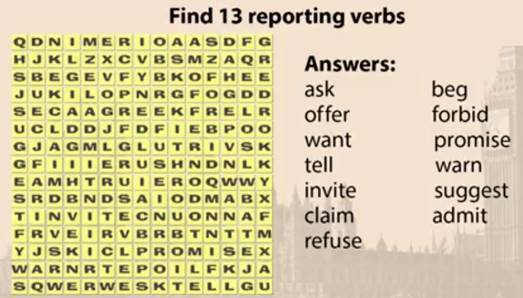 Follow the example and report the questions. Use the words ‘wonder’, ‘want to know’, ‘ask’. Example: “Do you like R&B?” – They wondered if I liked R&B. 1. “What are you doing here?” – She wondered ________________________________. 2. “Will it rain tomorrow?” – Yesterday he asked me ___________________________. 3. “Why didn’t Nick go to New York last summer?” – Yesterday Nancy wanted to know __________________________________________________. 4. “Must I do my homework this afternoon?” – Yesterday Barbara asked me __________________________________. 5. “Did Max fly to London two weeks ago?” – Yesterday Linda wanted to know ______________________________________________. 6. “When did you come?” – Betty wanted to know ______________________________. 7. “When can we have dinner?” – She asked ________________________________. 8. “Is he busy now?” – He wondered _________________________________________. 9. “How much pocket money does Lisa get?” – Frank wanted to know ______________. 10. “Where does Maria park her car?” – Ronald asked me ________________________. 1. …what I was doing there. 2. …if it would rain today. 3. …why Nick hadn’t gone to New York the summer before. 4. …if she had to do her homework that afternoon. 5. …if Max had flown to London two weeks before. 6. …when I had come. 7. …when they could have dinner. 8. …whether/if he was busy then. 9. …how much pocket money Lisa got. 10. …where Maria parked her car. 1. Why does he suddenly want to learn judo? – Don’t ask me ______________________. 2. Did she see us? – I don’t know ______________________________________. 3. Have they come back yet? – I haven’t checked ________________________________. 4. How is this supposed to work? – I have no idea __________________________________. 5. Whose children are they? – How am I supposed to know __________________________? a) why he suddenly wants to learn judo. b) how this is supposed to work. c) whose children they are? d) whether she saw us. e) whether they have come back yet. 1. Упр. 328 Голицынский Ю. Грамматика: Сб. упражнений. – 7-е изд., – СПб. : КАРО, 2011. – С. 270. 2. Упр. 329 Голицынский Ю. Грамматика: Сб. упражнений. – 7-е изд., – СПб. : КАРО, 2011. – С. 271. 3. Упр. 345 Голицынский Ю. Грамматика: Сб. упражнений. – 7-е изд., – СПб. : КАРО, 2011. – С. 280.